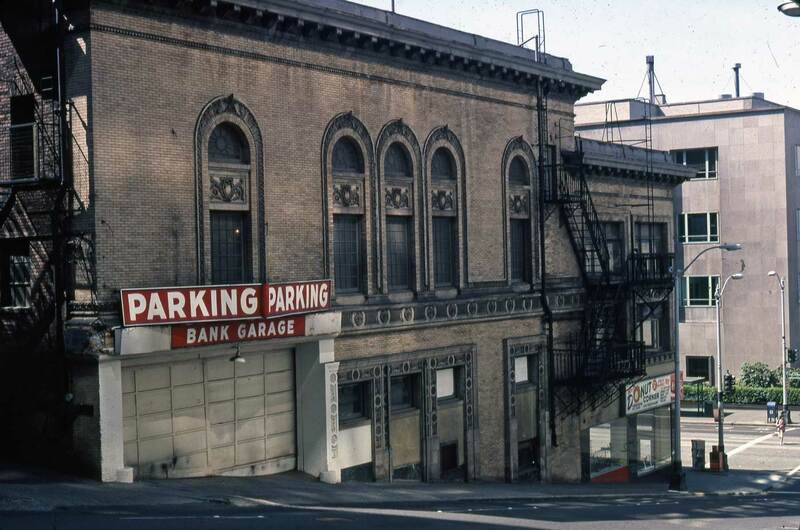 NOW: In 1930 the Palace Hip was converted into a parking garage and remained so until an office building in 1986 replaced it. Dazzled – we hope – last week by a musical pig dancing above the sidewalk on Second Avenue north of Madison Street, we made promises to visit this week another attraction on that block. By the time the Pig ‘N Whistle opened in 1919, its neighbor the Palace Hip Theatre, across Second at its southeast corner with Spring, had been showing animal acts and much more on stage for ten years. Thru its two decades the Palace Hip ran vaudeville, showed films, and staged plays. For all of these a theatre-goer’s visit to the confectionary across Second was often a capper to any show. Yes Jean – a few past features from the neighborhood, some of which has already appeared here, still we put them forward again following thereby a kind of Wagnerian formula of motifs repeated in new settings. Since five of these features include theatres we have a second motif. 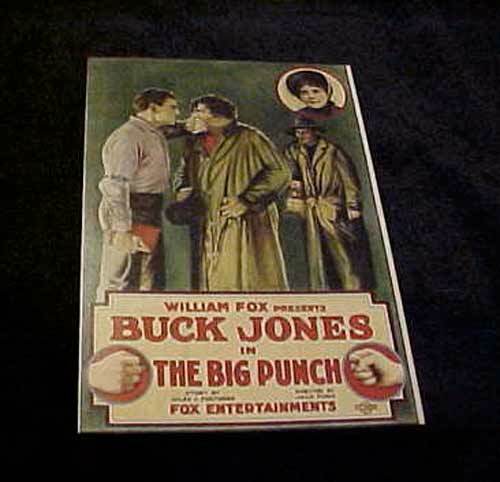 We’ll begin though with BUCK JONES in the BIG PUNCH, the Fox film advertized on the marquee and in broadsides pasted to the Palace Hip’s exposed walls at the corner and near the ticket window. From mid-block between Seneca and Spring looking south on Second Ave. ca. 1908. 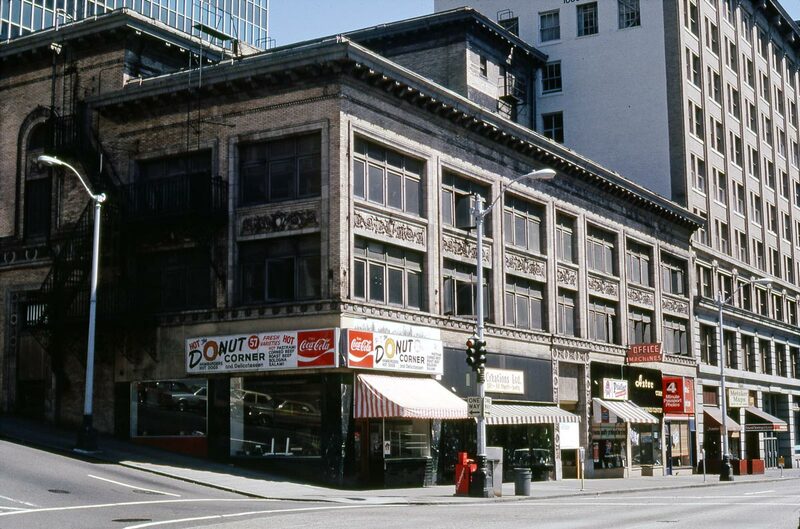 Frederick and Nelson Department Store is still in the Rialto Building right of center, and Considine will soon take the southeast corner across Spring Street on the left and replace it with his and architect Houghton's Majestic. By some agency when the Palace Hip was still the Majestic the name and even the style of its signage was repeated for the second floor cavity carver name the Majestic Dentists. The corner's oddly consistent promotions were topped by a tooth outlined with electric lights. 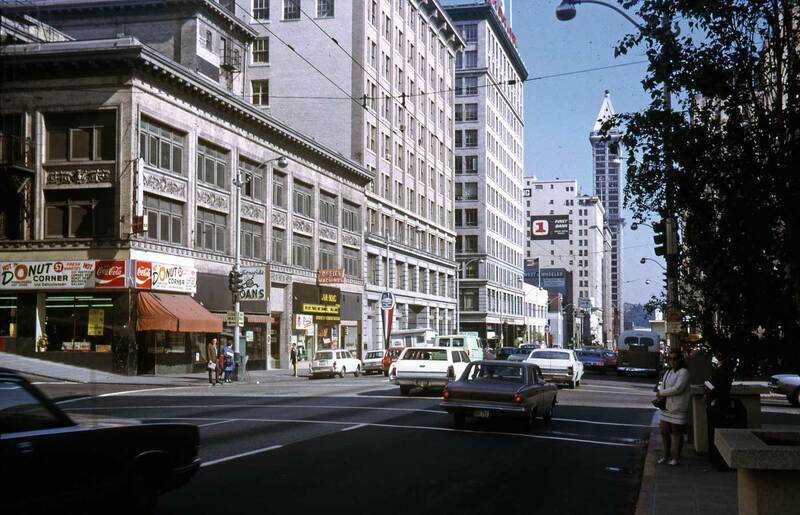 From a similar point-of-view as that above, Lawton Gowey recorded this look south on Second and thru Spring Street on April 6, 1967. Another Gowey recording of the block, this time on July 26, 1972 when the theatre's corner was taken by a Donut shop. Back again with Lawton and the donuts on July 26, 1981. 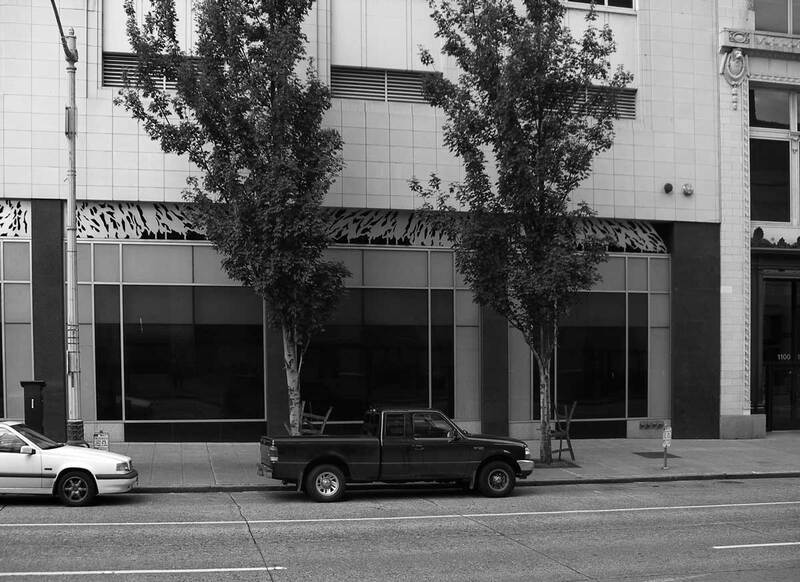 Here on May 23, 1981 Lawton Gowey concentrated on the old theatre's Spring Street facade. 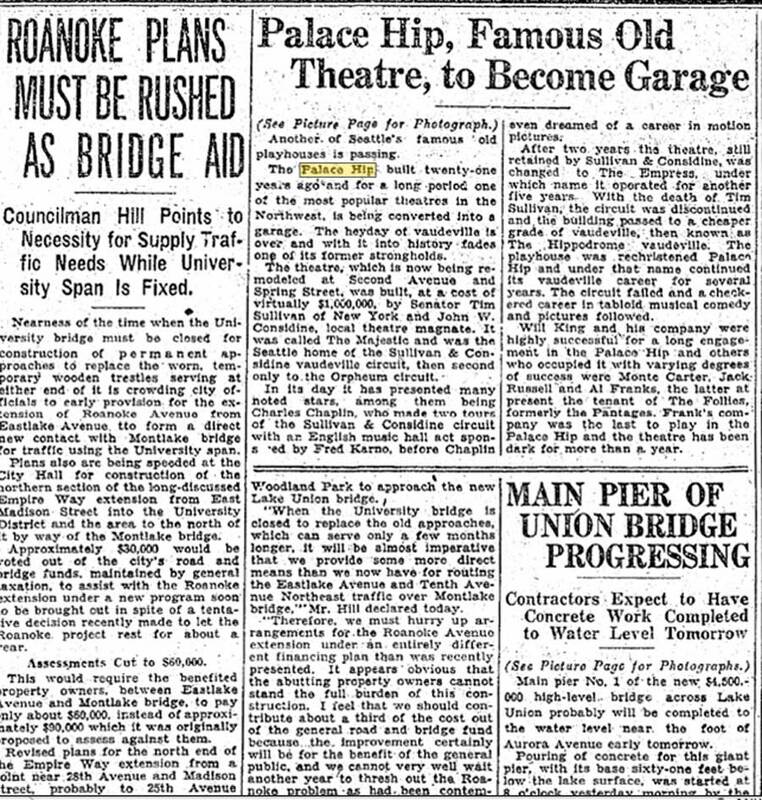 The August 22, 1930 Times clipping that follows announces the plans to convert the old vaudevillian into a parking garage that would endure decades longer than the theatre.. The Seattle Times, August 22, 1930. Showing the neighborhood, grabbed from the 1912 Baist Seattle map of footprints. The Pantages Theatre at the northeast corner of Second Ave. and Seneca Street. 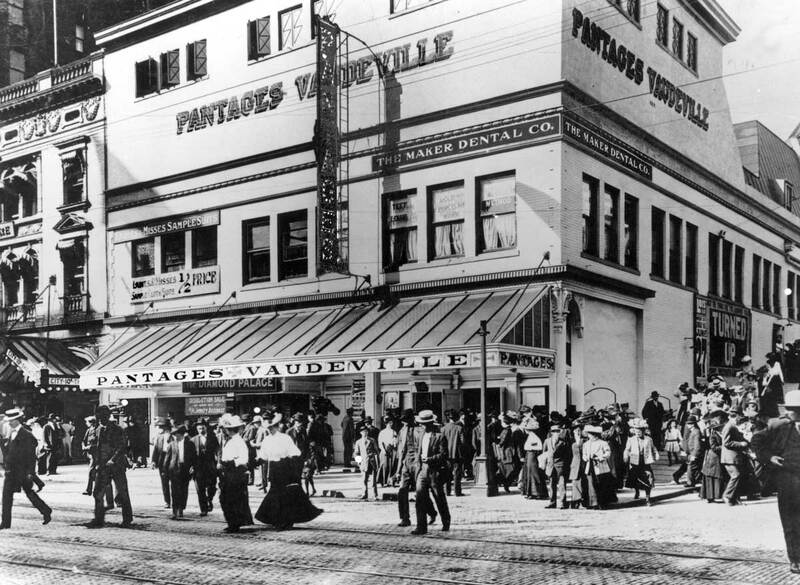 Pantages sold the sourdoughs vaudeville, at $25 a seat in his Orpheum theater in Nome. The price of admission to his first Seattle shows was a dime for a mixture of stage acts and short, jerky films. Pantages (or his legend) was illiterate, but having roamed the world before landing here he could converse in several languages. His English, it was said, was as bad as any. But he knew what the public wanted. 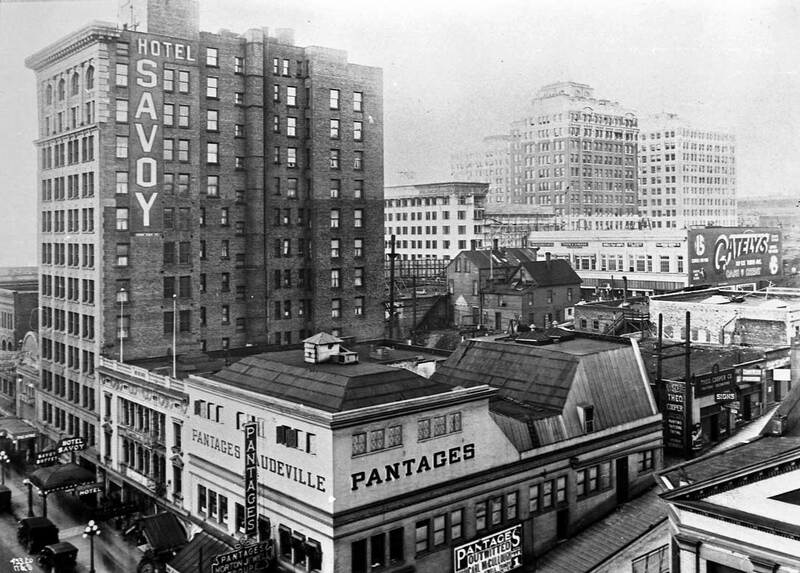 Pantages built a vaudeville empire that ultimately surpassed all others. Somewhat like royalty, his daughter Carmen married John Considine Jr., son of his chief competitor. At its peak the Pantages circuit included 30 playhouses he owned outright and 42 others he controlled. To an act he liked, he could offer more than a year of steady employment. 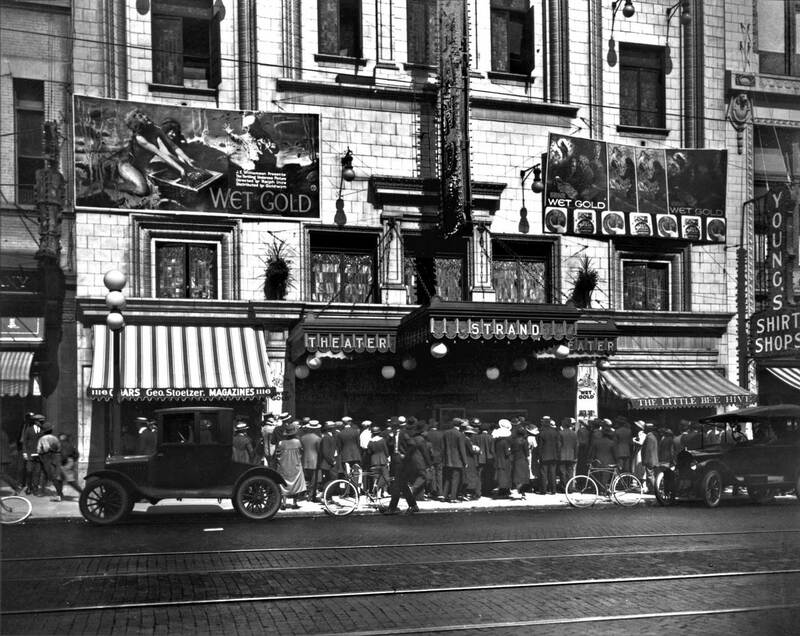 Pantages sold his kingdom for $24 million in 1929 – before the crash. Considine and Pantages, left and right. Another Webster and Stevens Studio look up Second Across Spring Street with both the Lois and Pantages theatres up-the-block and the Savoy Hotel too. 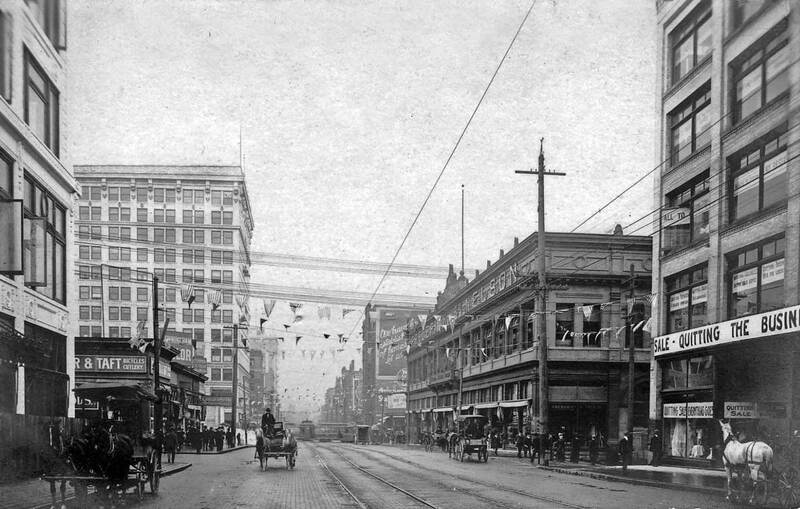 And more with the Baillargeon Building on the right at the northeast corner of Spring and Second. NEXT a look west on Seneca across Second Ave. to a pioneer home. Above: The scene looks west on Seneca to its northwest corner with Second Avenue, where, depending upon the date stands either the Suffern residence or Holy Names Academy, the city’s first sectarian school. (Pix courtesy of Michael Cirelli). 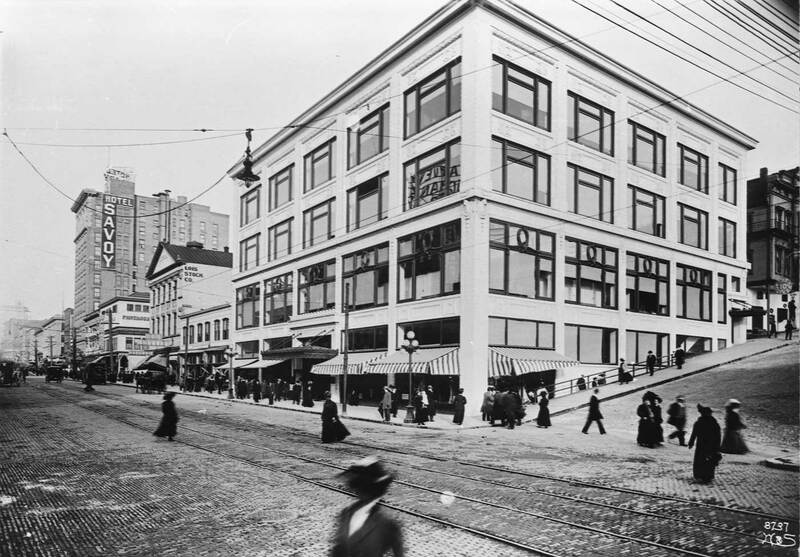 Below: With the economic confidence gained by the Yukon and Alaska gold rushes of the late 1890s, most of Seattle pioneer residences then still surviving in the central business district were replaced with brick commercial blocks. 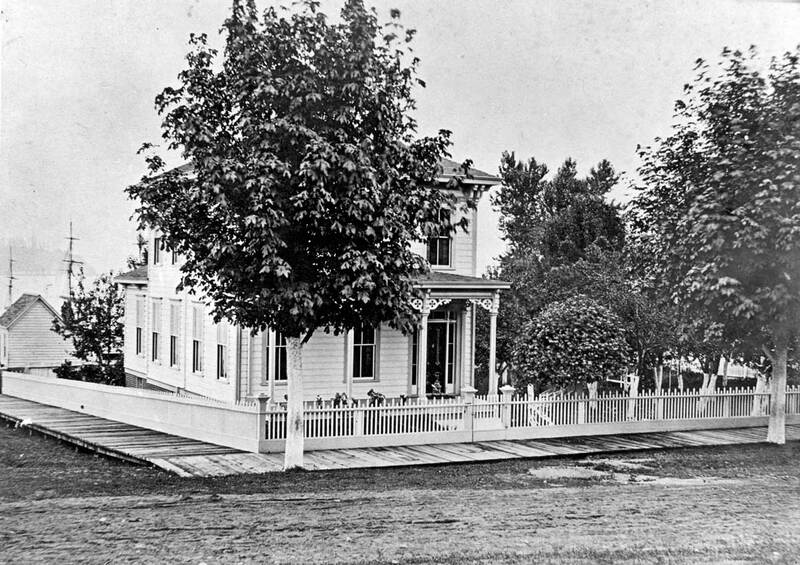 Sometime in the 1870s John Suffern built a sizeable home at the northwest corner of Second Avenue and Seneca Street. We see it here but not knowing the date of the photograph cannot say if the Sufferns are still living there or if it is in the learned hands of the Roman Catholic Sisterhood of the Holy Names. Also in 1880 the Sisters of Holy Names built a second and larger structure on their property to the north of this white (we assume) house. The addition included two large classrooms and a second floor dormitory for the city’s first sectarian school. It opened in January 1881 with 25 pupils, and grew so rapidly with the community that in 1884 the sisters built another and grander plant with a landmark spire at 7th and Jackson Street. The not so old Suffern home survived the city’s “great fire” of 1889, but was replaced in the late 1890s with the surviving brick structure, now (in 2007) the comely home for a Washington Liquor Store, and a custom tailor. 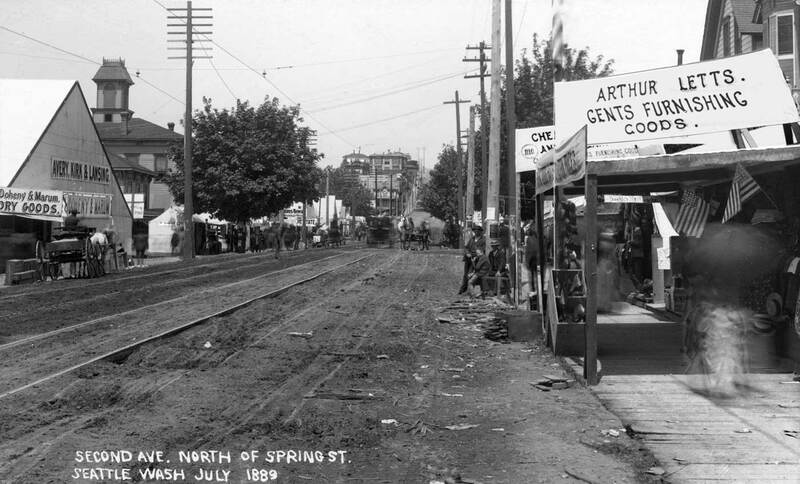 Above: Looking north on an unpaved Second Avenue in July 1889. 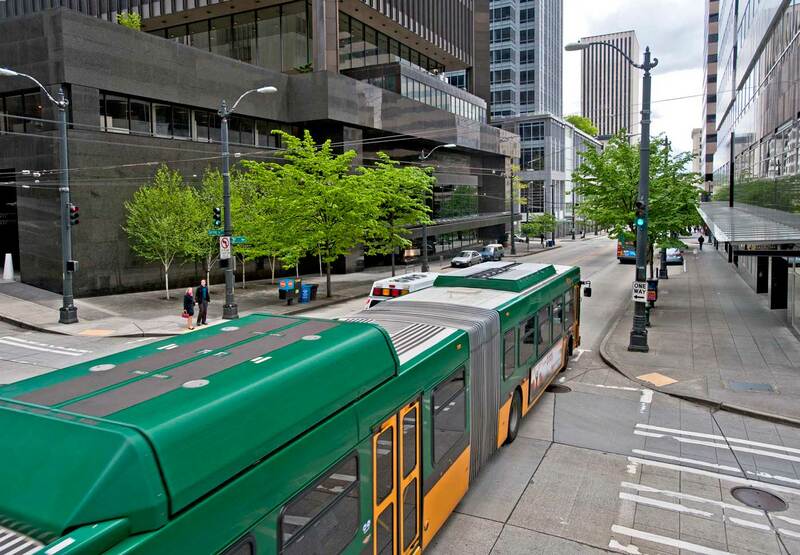 The nearly new tracks on the left served the first electric trolley on the Pacific Coast when the conversion was made from horses to dynamos earlier in March. 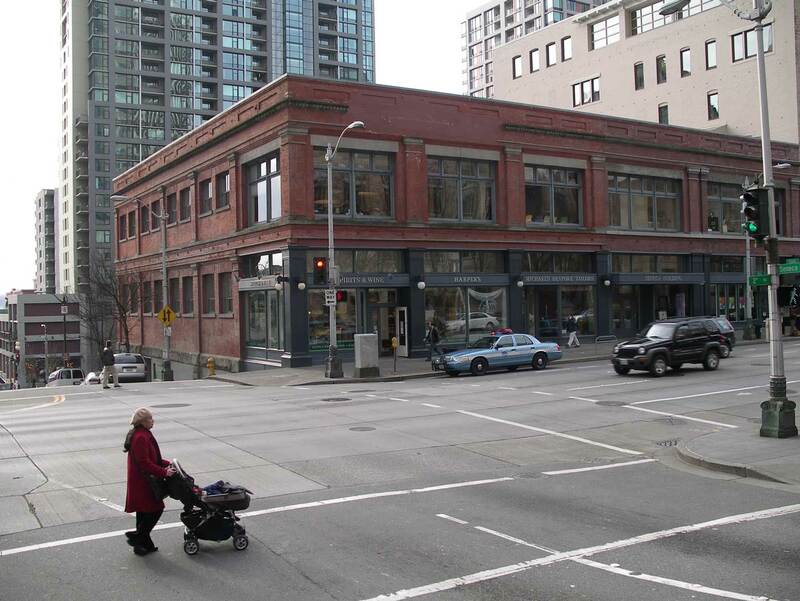 Second was paved in the mid-1890s and thereafter quickly became Seattle’s “Bicycle Row” with many brands to choose from sold mostly out of small one story storefronts, especially in this block between Spring and Seneca Streets. (Pix courtesy of Michael Maslan) Below: The widened Second north of Spring Street was half quiet when photographed on a late Sunday afternoon. 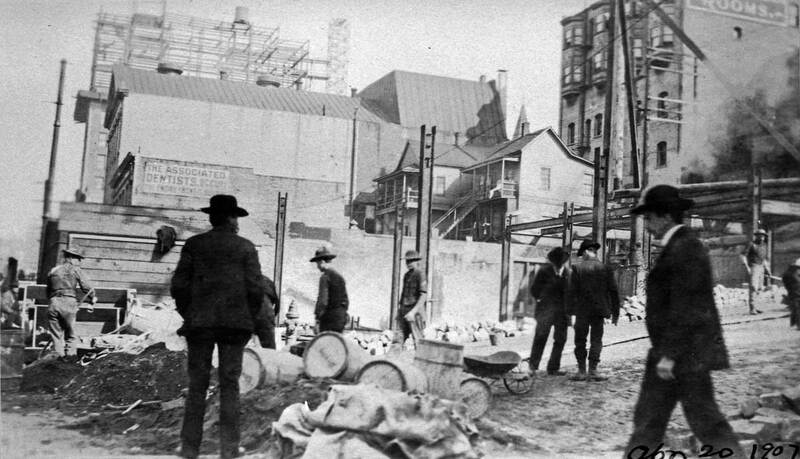 The city’s “great fire” of June 6, 1889 consumed most of the business district – more than 30 blocks – but not this block, the first part of Second Avenue that was not in some part scorched. After the disaster it quickly served in the rebuilding that turned practically every available lot and lawn on Second into a sewn strip of temporary tents. The Times for June 10 reported that while “the slabs and sawdust piles are still burning and sending clouds of smoke back over the town” over 100 permits had been issued to put up tents. 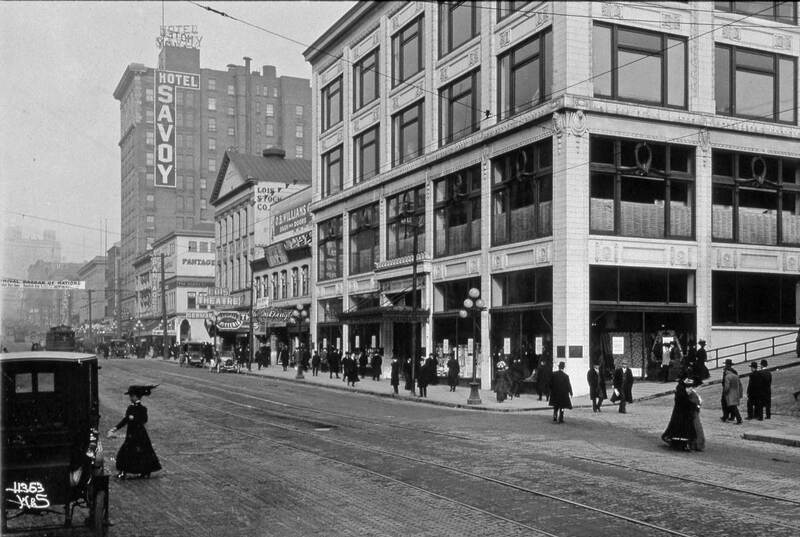 Judging by the canvas signs, the large tent on the far left, at the southwest corner of Second and Seneca Street, is shared by two firms: Doheny and Marum Dry Goods and the “manufacturers agents”, Avery, Kirk and Lansing. Before they were for the most part wiped out by the fire the two businesses were already neighbors at the northwest corner of Columbia and Front (First Avenue). Around two o’clock on the afternoon of June 6, or bout a half-hour before the fire started, Avery and his partners were suddenly $2,500 richer, when W.A. Gordon, a young man recently arrived from Maine, invested that amount, “everything he had” the papers reported, in the business. The sudden cash most likely helped with the construction of the big tent. Still we do not see Gordon’s name stitched to it. A few tents did business for a year before the city council decided there were “buildings enough for all” and ordered the last of them removed. Above: The post-1889-fire story directly above this one looked north on Second Avenue from Spring Street through a block of temporary tents and small frame structures in the summer of the city’s June 6,1889 fire. 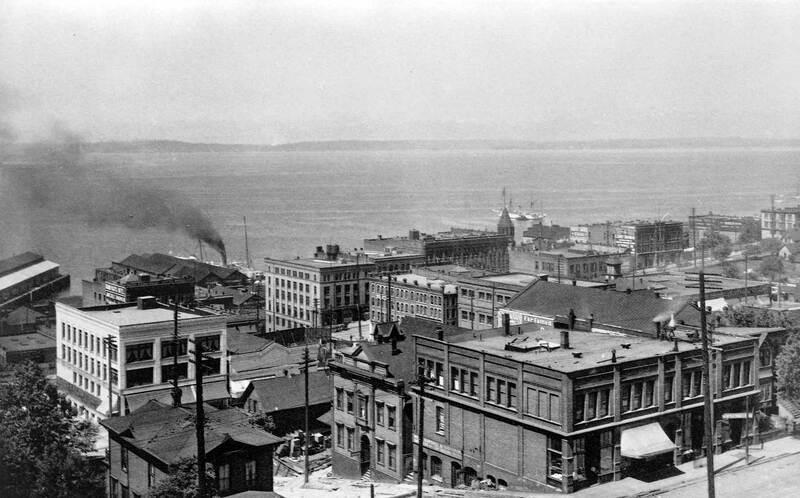 This view reveals part of the same block 32 years later in 1921. 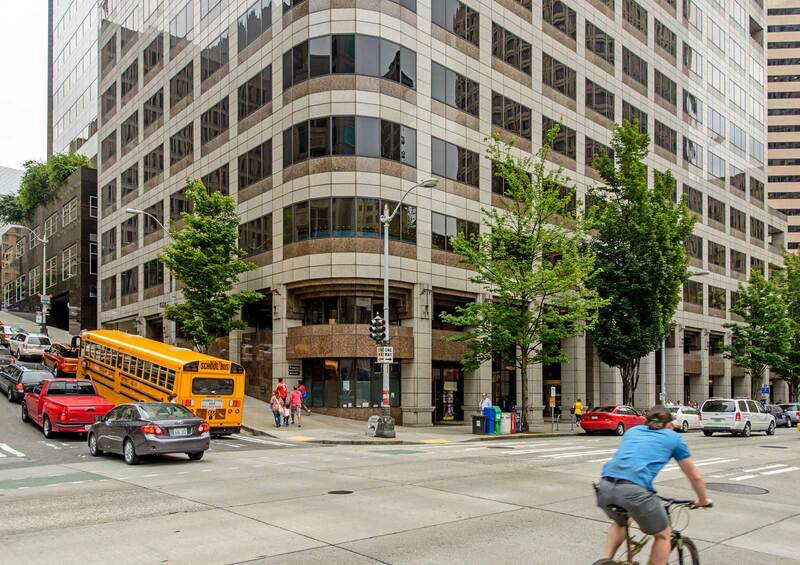 Below: A part of the Baillargeon/Pacific Security Building, far right, survives into the “now” scene. Built in 1907, it is, for Seattle, an early example of a steel-frame structure covered with terra-cotta tiles and ornaments. Above: Publisher William Randolph Hearst paid $200,000 for exclusive reporting rights of the Graf Zeppelin’s 21-day trip around the world in Sept. 1929. 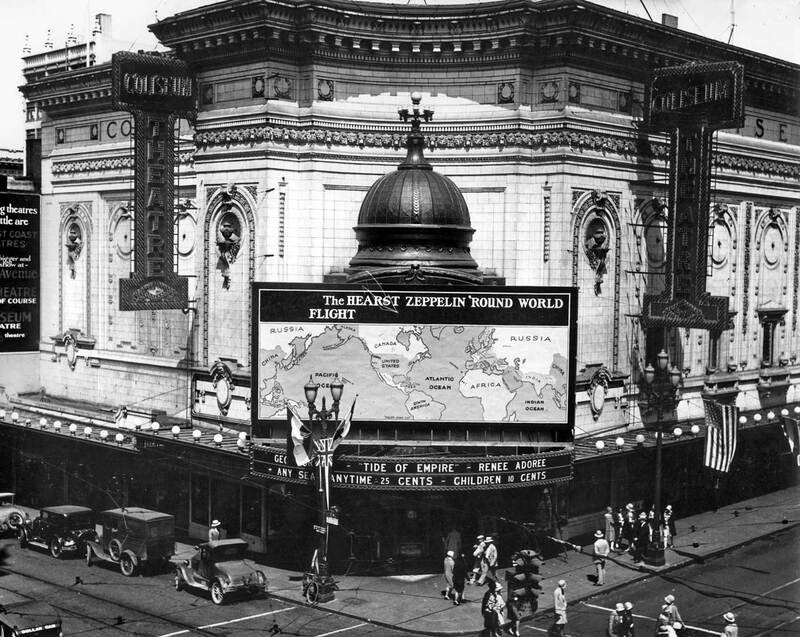 The big blimp neither stopped in nor flew over Seattle; still a world map (without poles) was painted by the Foley Sign Company and attached to the front of the Coliseum Theatre as part of the promotion. So that the pedestrians at 5th Avenue and Pike Street might be reminded of their place in the world, the lettering for “Seattle” was made larger than for any other city on the map. 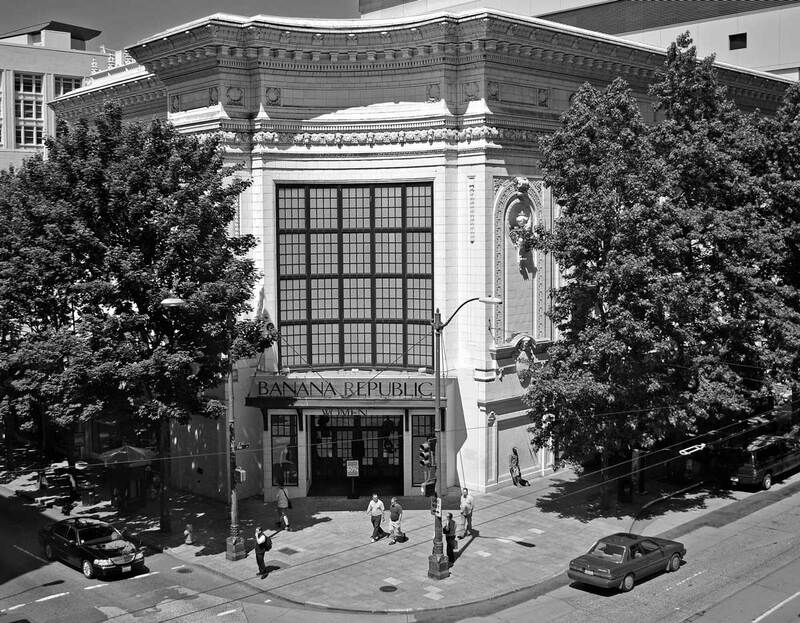 (Photo courtesy G. Sales) Below: Jean took the “now” from the third floor of the Washington Federal Savings Bank, kitty-corner to the Banana Republic, which in a local example of “adaptive reuse” arranged the landmark Coliseum Theatre for selling clothes and such in 1994, four years after the theatre went dark. Seattle architect B. Marcus Priteca designed the Coliseum Theatre, Fifth Avenue and Pike Street, for owners C. D. Stimson and Joe Gottstein. 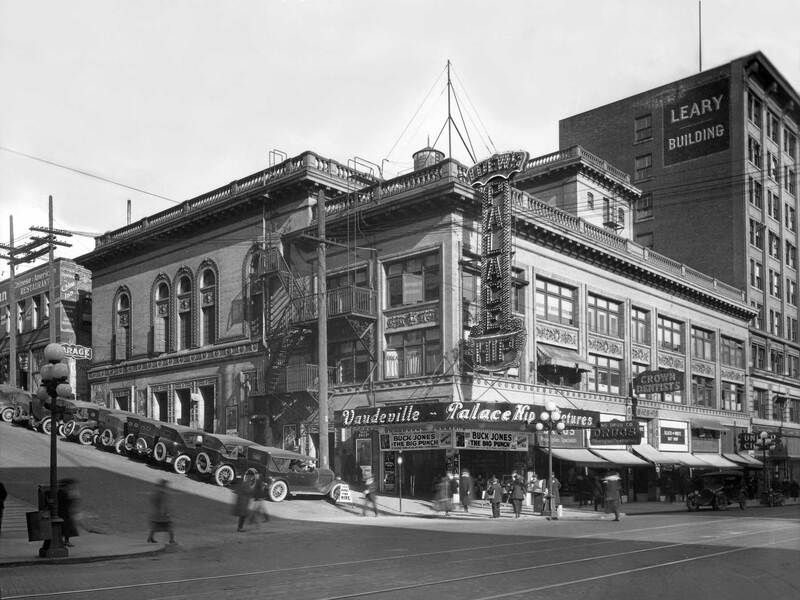 The theater opened on January 8, 1916 under the management of John von Herberg and Claude Jensen. The Coliseum was one of the first large theaters in the country to be designed specifically for showing motion pictures. That the stage was a bit small for the largest of vaudeville acts did not matter for it was claimed to be the largest and most lavish of theatres built not for stage acts but for films. As the legend matured it was also the first. Pantages concocted a neo-classical temple of such flash that the facets of its glazed white terra cotta façade were designed with the help of sciography: the study of sun angles. At night inset electric bulbs threw their own shadows. The lavish appointments continued inside with, by one report, “a symphony of upholstering,” which did not, however, dampen acoustics that were considered the best in Seattle – perhaps in the world! The theatre orchestra of eight players – plus a “giant Moller Pipe Organ”- were all Russians, again, the “highest paid in the U.S.” Fountains framed the orchestra pit and songbirds in wicker cages accompanied the players. By one count there were thirty canaries — probably the best fed in the nation. High above, the Big Dipper twinkled from the ceiling. 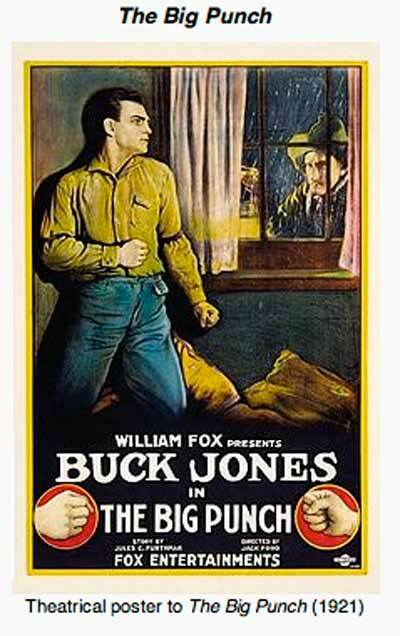 Released in 1929, “Tide of Empire” is the western melodrama advertised on the marquee. By the close of 1930, the star, Renee Adoree (meaning “reborn and adored”) had appeared in 45 films, the last four talkies, but not “Tide of Empire.” It was produced in the transition to sound and had only a sound tract for effects and music. Adoree’s role is reborn with a Google search for “youtube tide of empire, 1929.” From the Coliseum’s big screen it’s a bittersweet reincarnation as a low-resolution postcard-sized rendering on a computer screen, but the French-born star still dazzles. Above: The Metropolitan Track’s Hippodrome was nearly new when it hosted the A.F. of L. annual convention in 1913. 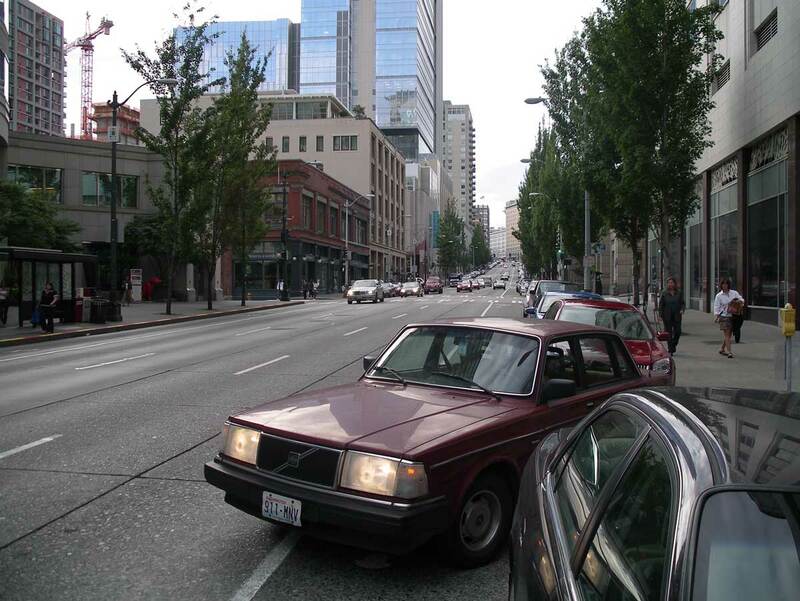 (Courtesy Old Seattle Paperworks) Below: Without a phalanx of posing delegates to protect him Jean wisely stayed away from the center of the intersection at 5th Avenue and University Street for his repeat. 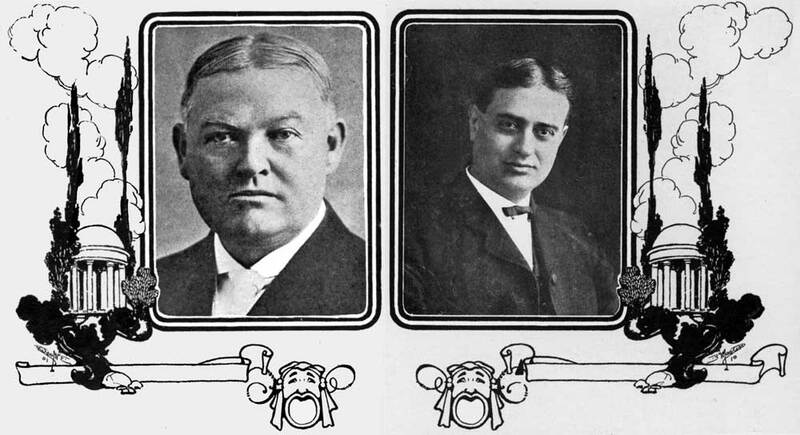 The by then venerable American Federation of Labor, the A.F. of L., held its 33rd annual convention in Seattle in the fall of 1913. Some of the convention’s grander events, like it’s Nov. 11 opening ceremonies, were held in the then nearly new Hippodrome at the northeast corner of 5th Avenue and University Street. About 3000 attended to hear the region’s star politicians, like Seattle’s progressive (although sometimes also puritanical) Mayor George Cotterill and the state’s governor Earnest Lister, shout their speech across the great new hall. 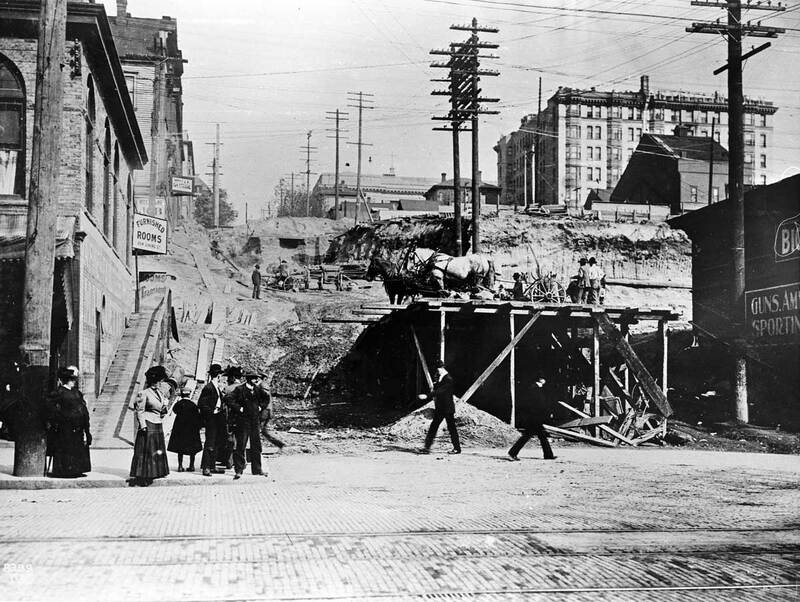 The Hippodrome’s promised construction may have been one reason that the union felt it could meet in Seattle. And yet the new hall was kept to only one story and designed as a temporary structure. The build-up of the ambitious Metropolitan Tract, the “city within the city” on the leased land of the original University of Washington campus, would take time and so was in need of some inexpensive fillers like the Hippodrome until grander structures could replace them. 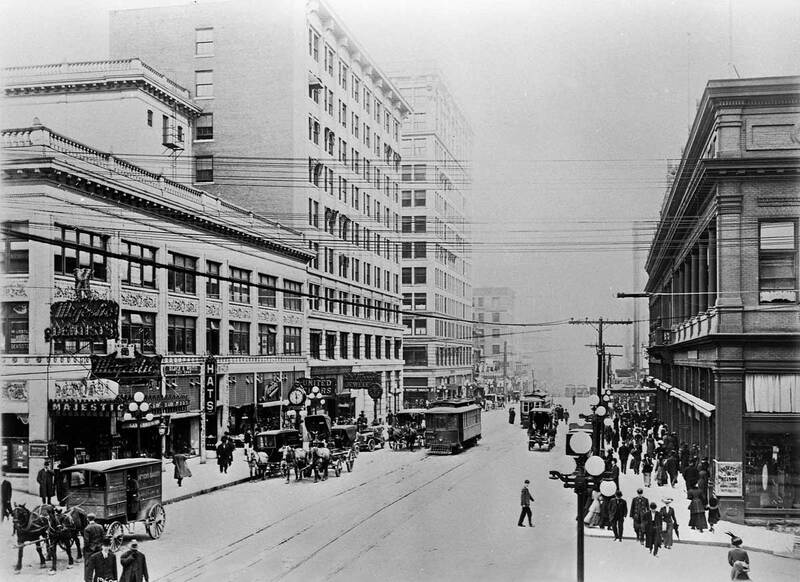 The Skinner Building (seen in the “now”) took the corner – and the rest of the block to Union Street – in 1925-26. At some point during the convention its 327 delegates poured out of the Hippodrome to pose for a panoramic camera. We have cropped the picture. When tightly packed, the posers extended from the southeast to the northwest corners of the intersection in an arch that centered at the entrance to the hall, as seen here. Readers who know their Greek will have figured that the name “Hippodrome” was chosen by the Metropolitan Building Company not in reference to its original use for an open Greek racecourse. Rather, it was for association with the name-familiar Hippodrome Theatre in New York, which when it was built in 1905 was called “the world’s largest theatre.” Houdini made a 10,000-pound elephant named Jennie disappear from its stage with the mere firing of one blank from a pistol. Would that it had been a hippopotamus. 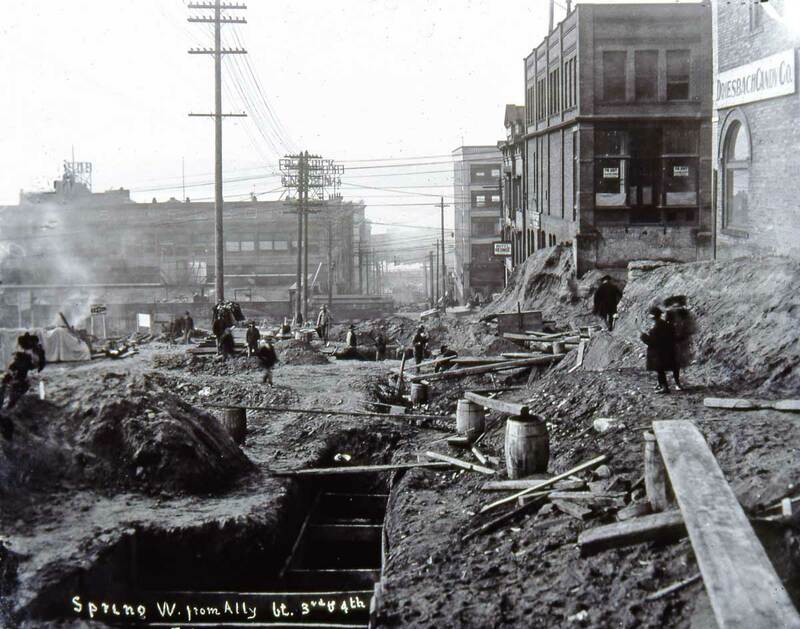 Above: Looking south across Spring Street and into the pit along Third Avenue for its 1906-7 regrade. Courtesy Lawton Gowey Below: Jean used his ten-foot extension pole again to reach an altitude more in line with the old grade of Third Avenue before its reduction. 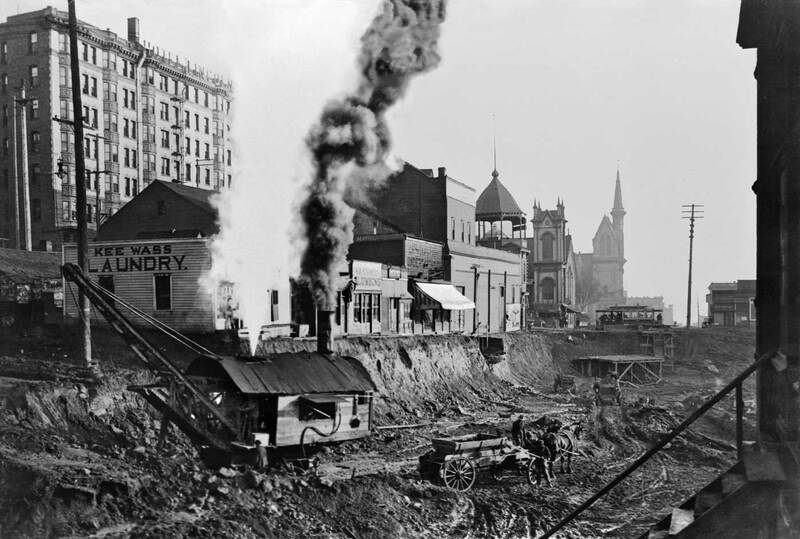 The steam shovel at the intersection of Third Avenue and Spring Street works on making one of the deepest cuts during the Third Avenue Regrade, which extended the eight blocks between Cherry and Pike Streets. Like Biblical signs, the shovel spews the good and the bad – steam and smoke – from its roof. An empty wagon waits for the shovel to pivot with its first contribution. Behind the rising effluvium are a row first of storefronts holding a laundry, a plumber and an undertaker. Beyond them is the popular Third Avenue Theatre with the open tower at the northeast corner of Third and Madison. Its 16-year run is about to end a victim of grade changes on Third. Across Madison are two more towers, both churches. First, the First Presbyterians at the southeast corner with Madison and one block south the second sanctuary for the first congregation organized in Seattle, the Methodist Episcopal Church at Marion Street. Both parishes moved to new sites because of the regrade. 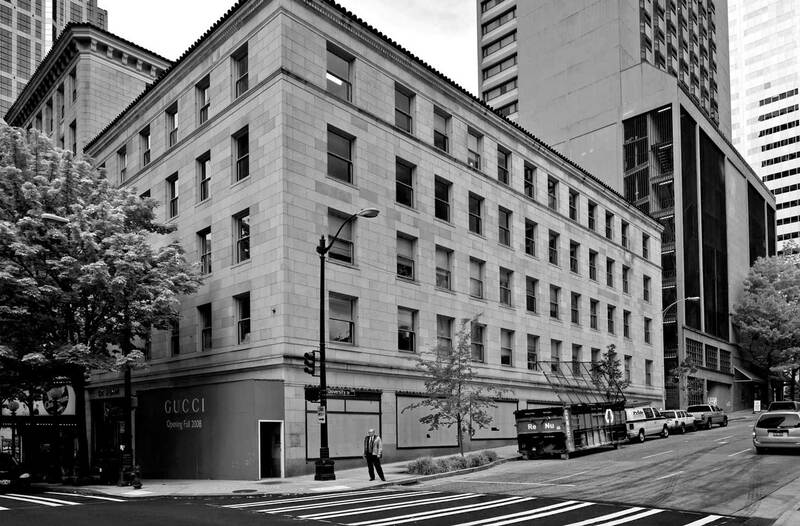 Upper left is the west façade of the Lincoln Hotel at the northwest corner of Madison Street and 4th Avenue. 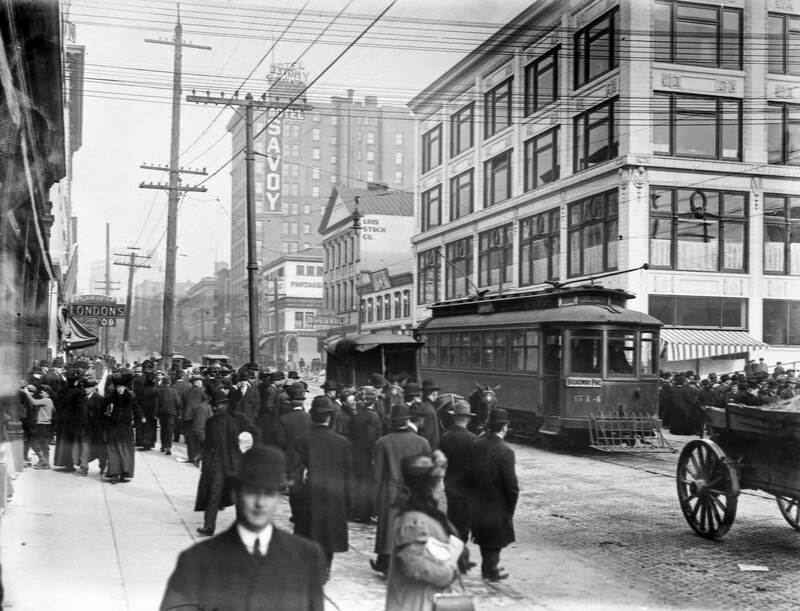 The regrading on both Fourth Avenue and here on Third were temporarily stopped in the summer of 1906 by an injunction brought by the hotel charging “damaged property” – indeed. More than damaged the hotel was destroyed by fire in 1920. The regrading of both Third and Fourth Avenues was necessary, it was explained, if the retail district was to spread east. First and Second were both filled and the steep climb to Third and Fourth needed to be eased. NEXT a few items pertaining to the regrading on Spring Street, most of it east of Second Avenue as Spring it brought down to the new and lower grades on Third, Fourth and Fifth Avenues. We’ll get oriented, again, with the detail from the 1912 Baist map. 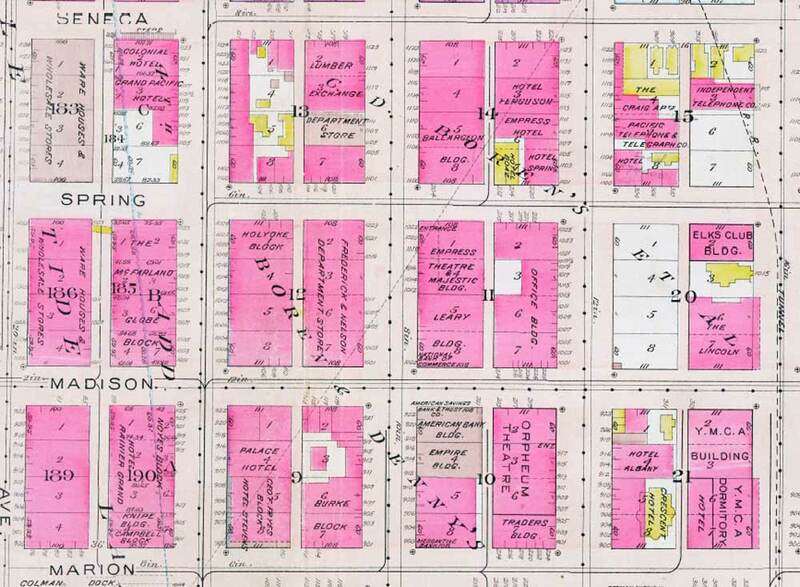 Note please the position of the Lincoln Hotel at the northwest corner of 4th Avenue and Madison Street, here far right in the second block up from the Marion Streete bottom of the detail. The Lincoln was used as a prospect for the early-century look - below - over our neighborhood before the regrading of Spring and, for that matter, Second and Third as well. Using Google Earth, the Baist Map and a free hand to mark that frame the Boaz Hotel - or its place - in both the Google view and the historical view printed just above. The Spring Street regrade east of Third Avenue. The grade at Third was hardly changed but that extended climb between it and Sixth Avenue was "significantly lowered." 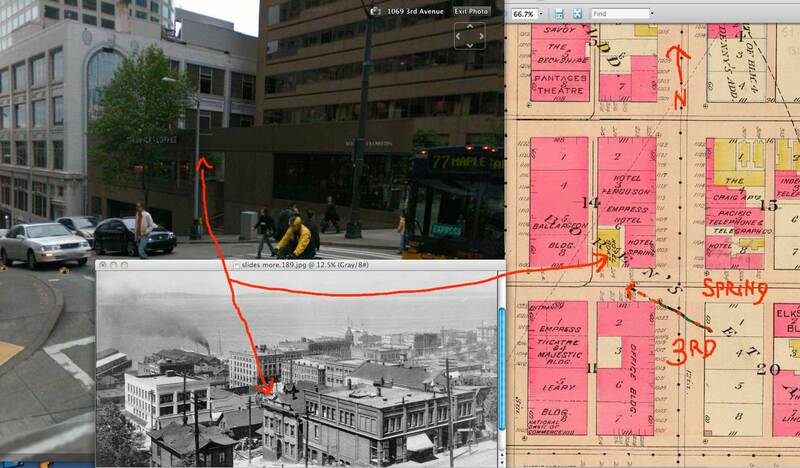 Note that some of the Boaz Hotel can be seen on the left, mid-block between Third and Fourth. The west and north facades of the Lincoln Hotel show above-right. During the regrade west on Spring from the alley between 3rd and 4th Avenues. Note that the Boaz Hotel is almost hiding one block distant on the right. The July 23, 1981 dating of this feature by Rick Anderson helps explain historian Lawton Gowey's visit (see above) to the corner three days later on July 26. Lawton was reading Anderson, and his office in the City Light Building was nearby. HUGH PARADISE's sort-of-familiar Seattle skyline recorded from Latona (Wallingford) in 1960. There is here as yet no Space Needle and no SeaFirst tower, but the pyramid top of the Smith Tower breaks the horizon. There is as yet no Ivar's Salmon House promoting a view in 1969 that includes the modern additions. 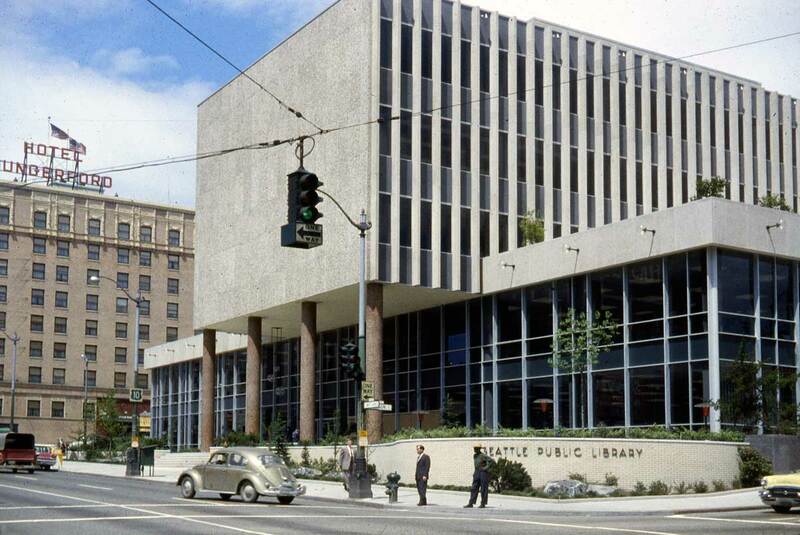 At the very bottom is Lawton Gowey's June 1, 1960 portrait of the then new modern Seattle Public Library on the same block where the post-modern library now unfolds. What a lovely gilded bug is that heading north on 4th! Can you still hear it? 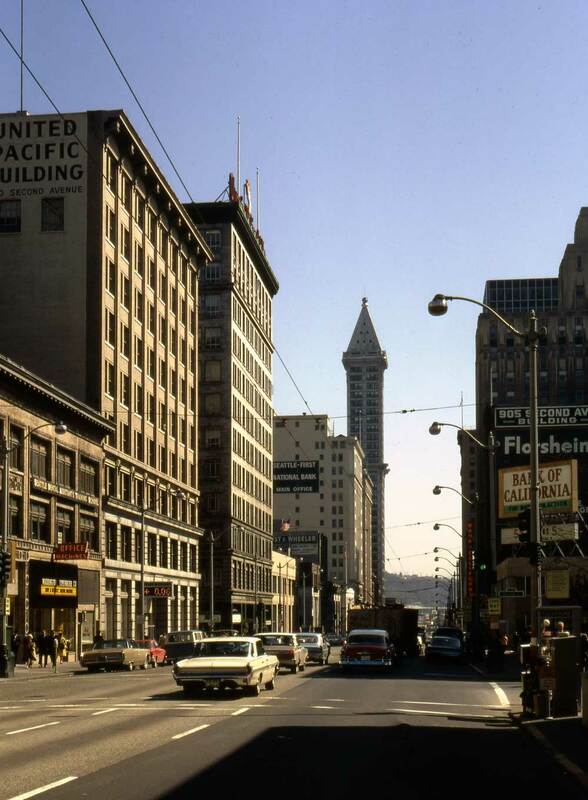 In between is Lenny Anderson's Feb. 1, 1960 Times feature on a by-gone Seattle inspired in part by a faded sign on the Palace Hip, which then still had more than two decades left for service to mostly Central Business District workers with cars. How man of these commuters could manage a confident definition of "Vaudeville?" How many could spell it? Quiz: How many of Anderson's choices do you recall? Hello Mr. Dorpat. I have been trying to reach you. You have several photos here that actually have my Great Grandfather’s Grocery and Vaudeville Business in them. He was the owner of the property where the Savoy Hotel was built and he also owned the property and possibly the Brooklyn Hotel for a time. He had various businesses in the building between the Brooklyn and the Savoy. If you look very closely you will see the word “Shannon’s” across the front of his building/business. He owned Shannon’s Grocery, Shannon’s Boston Grocery, he also owned and operated Shannon’s Vaudeville House, The Shannon Theater, The Manhattan Theater Company, and The Central Theater all out of this one location on 2nd Avenue. 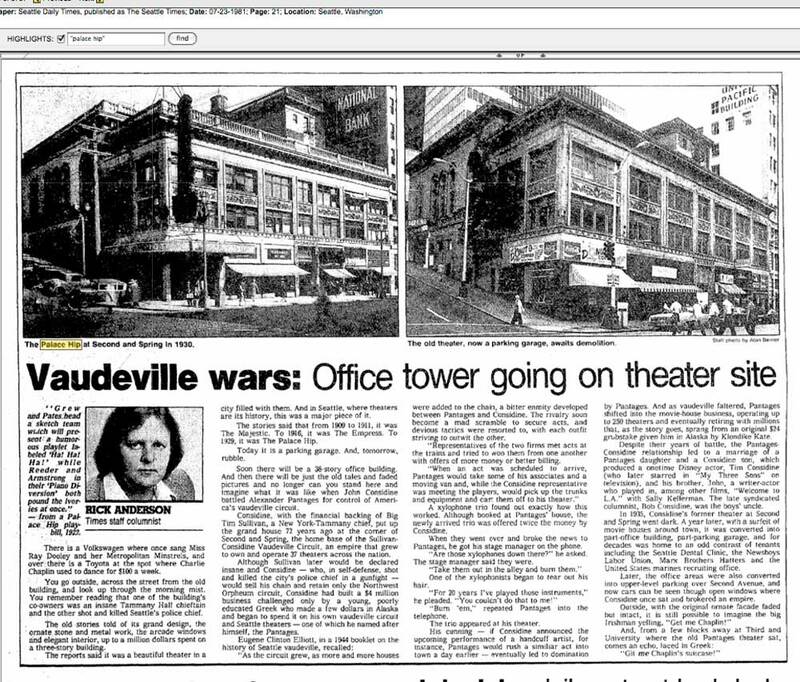 I have found articles where he was also the Manager of the Star Theater that John Cort and Tim Sullivan owned. My Great Grandfather was Richard Travis/Travers Shannon who was born in Boston, MA in Aug of 1865. He was known to many as Richard T or RT Shannon. He died here in Seattle in 1936 of a Heart Attack. And at that time he had owned and had been operating a store at 3411 Fremont Avenue. I have found a very interesting article where RT, Alexander Pantages, John Cort, John Considine, and Tim Sullivan were among about 8 Theater owners that were to be arrested for running their business on a Sunday which was against the law. I believe it might have had to do with serving alcohol as well. My Great Grandfather was the first Talking Picture Theater in Seattle. I would love to connect and share if possible. My mother is almost 81 now and she was born on Beacon Hill. It would thrill her to talk to you about this too if you are interested. She has so much knowledge of Seattle. You might find it very interesting. Thanks kindly for your time.